With an emphasis on preserving the rich tradition of American skilled labor, Field Aesthetic Manufacturing Company has devised an array of handmade sustainable products. The Green Mountains based company makes a line of organic soaps and ties, but their field bags are really what takes center stage. 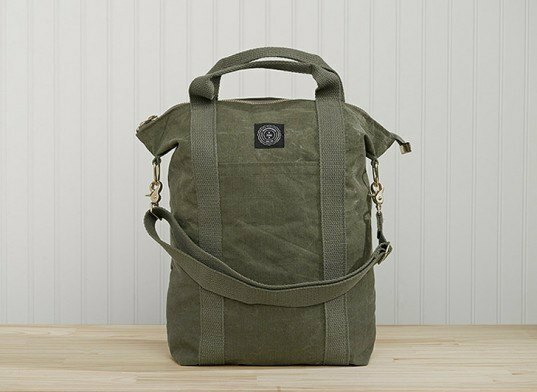 Made from recycled military tent canvas, the sporty unisex bags fuse handcrafted quality with upcycled fashion. Because each of the satchels, pouches, and even an apron, is made from a former military tent, it bears the same durability as the pop up structures that were taken into the field and used by soldiers of decades past. 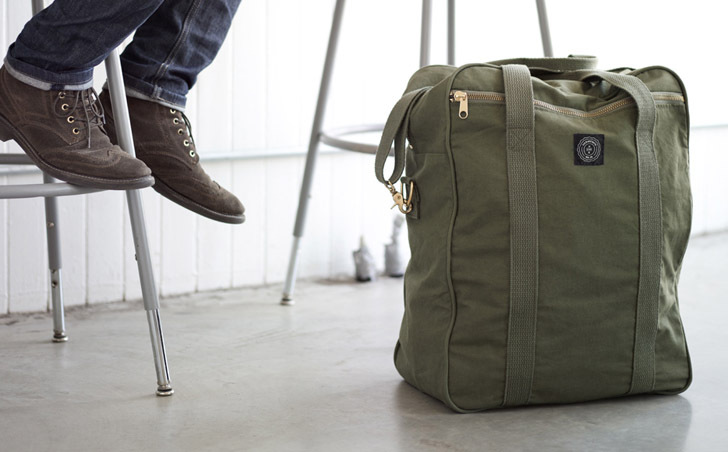 The well-worn army green is stylishly distressed, giving a vintage and historic flair that makes each bag slightly different than the next. The sturdy canvas is also water resistant. The upcycled bags are also convertible, adjusting for each personal need. The bag gives the user the option of using a shoulder strap, or converting it into a back pack. The small Dopp kit can be packed with toiletries, or hooked onto a strap to become a shoulder bag itself. Each of the bags is made by artisans in the United States from start to finish. The recycled materials are sourced from the military and other communities that Field Aesthetic has forged a support system with. Through establishing a sustainable business, from source to product, the company hopes to solidify and sustain business in their community for generations to come.